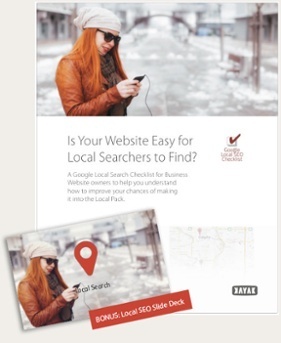 Local SEO Checklist - Can your Business Website Rank in Local Search? Can Local Searchers Find You? Can your Business Website Rank in Local Search? In our Local SEO Checklist, you’ll find a quick, simple, and convenient guide to organizing your website in a way that makes it easy for Google and local buyers to find you. You’ll get everything you need to attract customers in your area in a single resource. Download yours today and see just how easy it is to stand out with customers in your area!